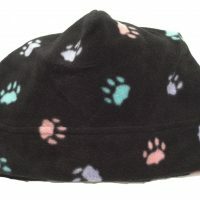 Soft, warm, and light, these adorable paw print gloves make a great gift for the animal lover in your life. These fanciful fleece gloves will keep your hands warm on cool days. They’re light and soft, and great for protecting your hands against leash and sun damage. Matching hat is available.